The financial corner of Birmingham’s Central Business District has a new tenant. 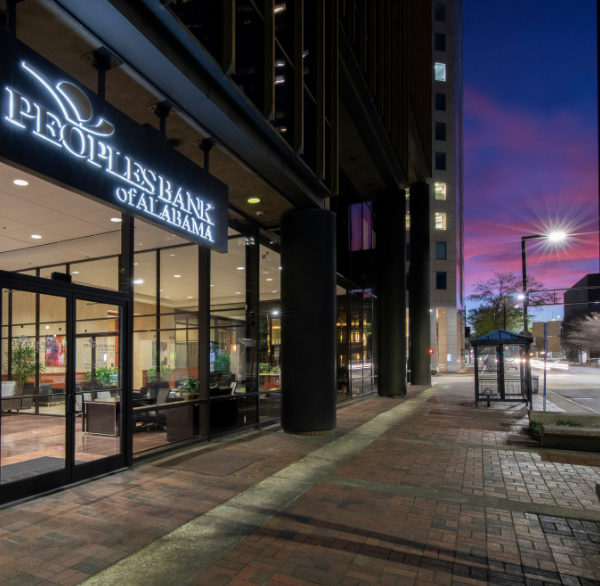 Cullman-based Peoples Bank of Alabama, which has offices in several metro Birmingham cities, has relocated some of its operations into The Plaza building, which once served as the headquarters for Regions Financial Corp. (NYSE: RF), but is now heavily occupied by Viva Health. The building is located at 417 20th St. N. Suite 100. The bank will host its grand opening on Wednesday. The bank takes up nearly 6,700 square feet at its new location. On the ground floor, the bank has a full-service retail branch with universal bankers, interactive teller machines and a fully integrated commercial banking team. On the eighth floor, the bank houses its credit and government guaranteed lending teams. We recently reported the bank would be relocating these teams from its Gardendale offices, and this move marks an expansion of the bank’s branch operations in Jefferson County. In total, 12 employees relocated to Peoples’ new Plaza suites, of which two were net new hires. The bank plans to continue with further staffing additions over the next 12 to 24 months, Barnett said. The bank, which has in excess of $771.95 million in assets as of Sept. 30, will continue to operate its full-service locations at International Park in Hoover, Warrior and Gardendale.